Picture - A view of the sole prototype (note the 'P' on the fuselage) of the Vickers Type 432 in the air. The Vickers Type 432 was a British high-altitude fighter aircraft developed by the Vickers group during the Second World War. It was intended to enable the Royal Air Force to engage the enemy’s high-altitude bomber aircraft. It was to be armed with six cannon. The origins of the Type 432 lay with a requirements set out in 1939 for twin engined fighters with 20 or possibly 40 mm cannon. Vickers had set out a proposal for a Griffon engined aircraft, equipped with a 40 mm cannon in a flexible mounting. This was subsequently encouraged by the Air Ministry. Further development was carried out for a design that could also meet F.6/39 for a fixed gun fighter with 20mm cannon. Specification F.22/39 was drawn up to cover the 40mm project as the Vickers 414 to meet Operational Requirement (OR) 76. This was subsequently revised with aircraft redesigns to become specifications F.16/40 and then F.7/41 for OR. 108. 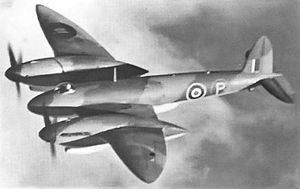 In appearance it resembled a larger version of the de Havilland Mosquito. The pilot had a pressurised cockpit in the nose, with a bubble dome, similar to an enlarged astrodome. The pressurised cockpit took up the nose section so the cannon would have been fitted in a fairing below the fuselage, to the rear of the aircraft. The first prototype Type 432 was flown on 24 December 1942; initial trials revealing serious handling difficulties on the ground, the aircraft snaking while taxiing, necessitating aft movement of the mainwheels to correct the bad tracking. In flight tests, the Type 432 was unable to be landed in a standard "three-point" stance resulting in the replacement of the Irving-type ailerons with new Westland types along with an alteration of tail settings. The estimated maximum speed of 435 mph (700 km/h) at 28,000 ft (8,535 m) was never attained as the Merlin 61 engines did not run satisfactorily above 23,000 ft (7,010 m). When the competing Westland Welkin was ordered into production, the second prototype of the Vickers fighter, the Type 446, was cancelled before completion on 1 May 1943. The first prototype was retained by Vickers for test purposes until the end of 1944, when the aircraft was scrapped after completing only 30 flights. Gunston, Bill. Back to the Drawing Board: Aircraft That Flew, but Never Took Off. London: Zenith Imprint, 1996. ISBN 0-76030-316-9.